Q1. Using the basic MPLS VPN mechanisms, is it possible to have overlapping IP addresses within the same extranet VPN? Q2. How can the issue of overlapping IP addresses between different sites in an extranet be resolved? Q3.What are the two different formats that can be used for the route distinguisher (RD)? Q4. 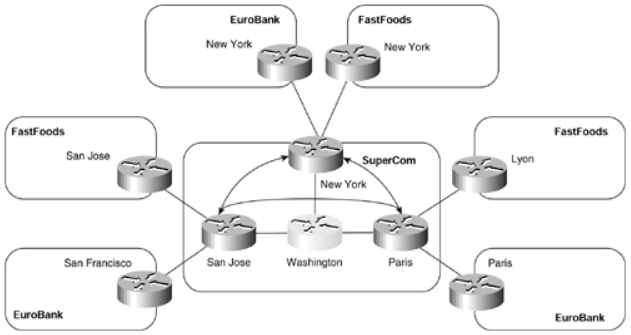 Does the RD have any special meaning for BGP? Q5. How are loops prevented between VPN client sites when these sites are multihomed to the backbone? Q6.What type-code is used for the route target within the Extended Community attribute? Q7. What must you configure to enable static routing, or routing information learned through RIP version 2 or OSPF to be advertised between PE routers? Q8. Which specific BGP capability must be supported between PE routers to enable the successful exchange of VPNv4 prefix information? Q9. What information is carried within the MP_REACH_NLRI attribute?